Iran, once Persia, is a major player in the Middle East. It has a large land territory and is centrally located in Eurasia and Western Asia. It has a wide array of neighbors including Turkmenistan, Afghanistan, Pakistan, Azerbaijan, Armenia, Turkey and Iraq. It is also close to Kuwait, Saudi Arabia and the United Arab Emirates which are located south and east of the Persian Gulf. Iran’s population is slowly growing and estimated to have surpassed the 80-million-inhabitants mark as of 2016. The fertility rate is just slightly below the natural replacement rate, while life expectancy is slowly but steadily increasing. Overall, few people are over the age of 65. The capital of Iran is Tehran, and most of the country's population lives in or close to urban areas. Neighboring countries and the world have been skeptical of Iran’s nuclear program for the last 15 years. Iran’s nuclear activity is worrisome for many nations around the world and it is feared that Iran’s actions could fuel a nuclear arms race in an already unstable region. Due to these worries, Iran has faced a number of international sanctions to stymie its nuclear capacity. 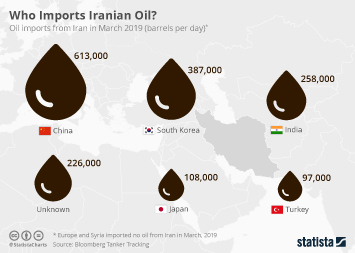 Iran’s economy has suffered because of these international sanctions; even though Iran has the fourth largest oil reserves globally, daily oil production has decreased significantly since the first sanctions from the United States were put in place back in 1978. Increased sanctions in 2012 had a significant impact on Iran's GDP thereafter, resulting in a short spell of negative growth rates and turmoil. During the same period, Iran's inflation rate soared dramatically, reaching over 30 percent. This has been difficult for Iranians, especially as the average per capita GDP dropped significantly at the time in addition to experiencing relatively high rates of unemployment. Due to Iran’s troubled relations with the west and many of its neighbors in the Middle East, trade has been limited to countries outside these regions for both exports and imports. This has been challenging for Iranian economy. Iran is working towards improving its international relations and remove sanctions by making its nuclear activities transparent. However, Iran has accumulated a wide range of enemies in the region, and the war in Syria and contradictory opinions regarding who to support in the region, could intensify already stressed relations. Most recently, relations with Saudi Arabia have deteriorated dramatically, when Iranians protested the execution of 47 men, including a Shiite cleric, on terrorism-related charges in Saudi Arabia. The protesters attacked the Saudi embassy in Tehran, and Saudi Arabia cut all diplomatic ties with Iran in return. Which attributes do you associate with products made in Iran?